The Trust’s first nursery was established in 1988 with a $25,000 grant from the New Zealand Lottery Board. 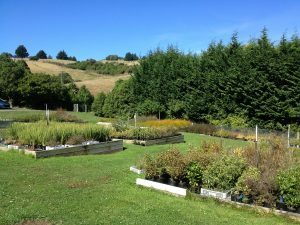 This nursery was established in 1989 in the grounds of Dunedin Methodist Mission Home at Company Bay on the Otago Peninsula. In those days, the nursery annually produced about 5000 plants. Jim Ellison was employed to oversee the production of plants, and to coordinate planting, fencing and weed control in the hoiho habitats. In 1993, the nursery moved to private land in Company Bay, where there was more area for growing flaxes and installing a glasshouse, shade house and tool shed. Unfortunately the site has very poor drainage, which limited the number of plants able to be grown. Seven years later, in 2000, the nursery moved next door to a decommissioned Dunedin City Council sewerage plant, leased to the Trust for a peppercorn rental. This present site has even more room for plant propagation, a sunnier aspect and lockable buildings. When Jim Ellison retired after thirteen years in 2002, Margaret Suman and Anita Pillai voluntarily managed the nursery for a year. In 2003 they won funding from Vodafone ‘World of Difference’ programme to pay for their salaries and expenses as co-managers. When Margaret moved to Nelson in 2010, Anita Pillai took sole responsibility for the role of nursery manager until July 2015. Today, Louise Ashton oversees nursery operations.